Following the volleyball team’s win at Brookhaven on Oct. 12, Eastfield coach Brandon Crisp, expecting a good mood throughout the team, instead sees volleyball players Kalli Caddell and Alyssa Tomlin consoling their teammate, Maura Munoz, crying on the bleachers. Fearing a potential injury, Crisp asked Munoz if she was OK but she didn’t want to talk about it. Later that evening, in the Eastfield parking lot, Crisp again approached her and asked what was wrong. Munoz was calmer then and was able to talk without breaking down. Munoz told him that her mother had been diagnosed with stage 3 breast cancer. Veronica Munoz, 34, was diagnosed the day before. Munoz said she struggled to take it all in and was deeply affected by it in the following days. Munoz began thinking of leaving school to focus solely on trying to help her mother and her family get through their difficult time. Munoz found out when her younger sister, Monica, texted her Oct. 5 about some medical documents that she found in their mother’s purse. The papers said a tissue sample and a biopsy test were taken from her breast. Munoz called to question her mother about the incident. She began to fear the worst after her mother confessed she had been seeing the doctor for some time now. The final results would be given in about a week. 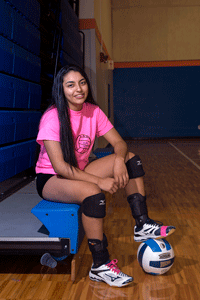 Munoz said the days leading up to her mother’s diagnosis affected her volleyball play. She had off-days while at practice and couldn’t focus during drills. Her team noticed her change in mood and that she wasn’t being her usual, cheerful self. The following Wednesday, the cancer was confirmed. Crisp said he was heartbroken and taken aback when Munoz first explained the situation to him. Munoz pondered the possibilities of what would come after the diagnosis. She didn’t know how the family would cover costs. She didn’t know what would become of her mother’s health and the issues that would come along with it. “I was just thinking, ‘What’s next?’ I wanted to move on from that day, from that week. I just couldn’t believe it,” Munoz said. Munoz knew she had to tell the team eventually. She first told Tomlin, a teammate from high school in Haltom City. When Tomlin was first told about her teammate’s difficult news she broke down. That Friday, she talked with Crisp and decided that she would tell the rest of the team the next day, Oct. 14, following the game at Dallas Christian College. When she finally told them what was going on, they all hugged her and promised to be supportive. On Oct. 31, Veronica underwent surgery and it was discovered that the cancer had moved to the lymph nodes. She’s since been at home and Munoz often visits and stays the night to take care of her mother. The team has since bounced around ideas of starting fundraisers and awareness campaign for Veronica’s diagnosis to help with the cost of treatment. Munoz even started a GoFundMe page for her mother, which has since raised nearly $3,000 out of a $15,000 goal. Crisp said that he believes the situation has brought the team even closer together as they prepare to compete in the NJCAA Division III national tournament. He hopes they have also given Maura the support she needs. Crisp said he is amazed by how much Munoz has handled the past few weeks. The volleyball team had two pink-themed games for breast cancer awareness this season. 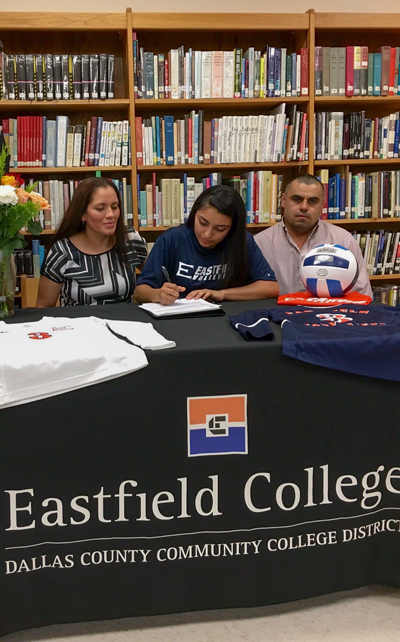 The second of the two on Oct. 16 that was special because Munoz’s family made the trip to Eastfield. Veronica was called down to the court where the team vowed support for the family. Assistant coach Lisa McGuire quickly made up some custom pink shirts the weekend before with a breast cancer awareness ribbon for the team. They were also given pink shoelaces and pink athletic tape to use in games. On Munoz’s left shoe, she wrote “MOM” on the pink duct tape near her toes. The team continued to wear pink accessories throughout playoffs. Tomlin said now everyone has a more personal reason to go along with the pink color scheme of the month.